It’s a bit of a struggle, I know. Do I really need a website? How do I start? The answer is ‘yes’, every business needs a website nowadays. Living in an era driven by technology and internet the online presence became a necessity. But there’s no question that having a website will help you reach to a lot more potential customers and help you develop your brand. It’s a completely new channel to show yourself and market your business. From social media to search engines, you can reach to a broad amount of people and potential customers. It doesn’t matter if you’re a small home based business, freelancer that needs his work to be seen or a small business owner. Arguably, having a website can actually have a great impact, it’s an impressive way to show your skills and commitment. You are going to ask “Isn’t it expensive to have a great website?” and the answer is “No!”. You can even build it yourself. Super fast and beautiful. Even without any previous experience or coding skills! So let’s get started with 4 steps on how to build the perfect website, with no budget. Simvoly is an amazing place to build a modern, beautiful website, without any struggle. Maybe you’ve tried builders before and had a headache after half an hour, trying to figure out all the functionality and navigation. That is not the case with Simvoly. It's a builder that knows how hard it is to create a website for a first time, so everything is very clean, easy and enjoyable to work with. The other nice thing is that you get everything - domain for free, great hosting and of course an amazing website for you to tailor. You don’t have to bother to buy domains and hosting and then bother friends to help you connect them. That's a hustle and expenses before you even have a website. Registering is simple. Name, email and a password, and your internet journey begins! Right away you will be redirected to a screen with plenty of beautiful themes, suitable for any business. Everything about them is customizable to become your unique little internet island. Don’t worry if you like a different theme. You can always change between templates and create other websites. Compare them one to another and ask your customers or friends for opinion. Start by changing the logo since it is your true identity. Or you can add your company name and make it stylish with one of the available fonts and different settings. Next - figure out what to show on your homepage. You need a catchy page, explaining your business, which will take the attention from the first view. With Simvoly there are plenty of great widgets and whole pre-made sections to drag and drop so you don't have to do them yourself. Isn't that cool?! Great images is a key factor. Everybody likes images, people like to see something to connect to the text they are reading, it helps the message to go smoother into the person’s mind. Also having only text usually bores the visitors and they probably won’t bother to read it at all. But what images should I use? You can use your own showing your business, your product, your work but before uploading an image always check the size of your images. A common mistake is to upload images to your website that are straight taken from the camera or phone with very high resolution. Don’t get me wrong, your images should be nice and crispy but are usually too big and heavy for a website and will load way too long for the visitors. Homepage - The main page the visitors will see when they enter your website and the most important page of course. About - It’s always nice to read about the team behind the business, see a picture or their values and goals for the future. Contact - A key to every business is to have an accurate contact page. You can add a map if the location of the business is a key, add social links, emails and of course a contact form as the fastest way to keep in touch with you. Portfolio - Simvoly has an amazing portfolio feature to showcase your products or services. 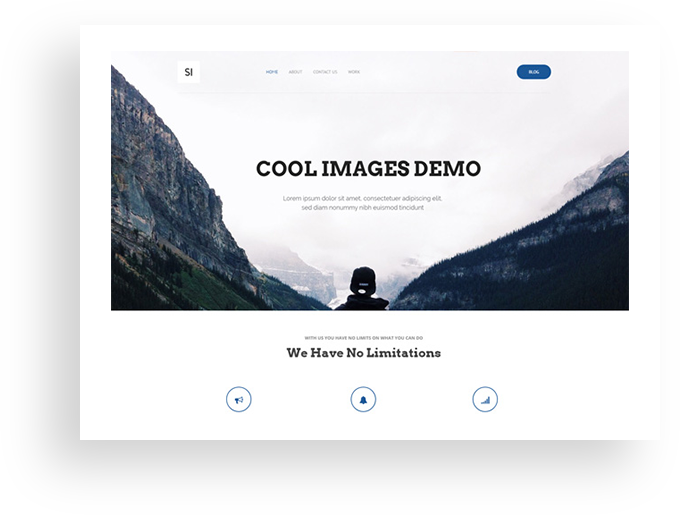 You can switch between different layouts and have dedicated pages for each of your portfolio items. Blog/News - Having this is nice to keep the visitors return to read something new or follow news in the area your business is. It’s not that important but it’s nice to have if you have something nice to write about. Don't have a few hours to edit the website yourself? Having a business sometimes leaves you without much of a free time. Simvoly offers to do it for you for a small fee. They will change your content, find some cool images and style the website the way you want. After you add content on your website - show it to a few friends, collect some thoughts on what you can improve. You can even create a few websites with 14-day trial to try different things and compare. Once you decide on which one you absolutely adore and have no patience to show to customers, share it on Facebook or add to your new business card, comes the easiest part - to subscribe to make it available to everyone. With a yearly subscription, you can save some money and even get a free domain to save even more.